We are moving house in two weeks time, which is very exciting. We’re only moving to the next suburb, so staying in the Inner West, but to a place with a bit more space. Most excitingly, the new house has a bicycle lane right outside the front door! The down side is that it doesn’t have much outdoor space, so I’m not quite sure how I’m going to store all my bikes (the current place has a decent sized shed in the garden). Anyway, we are in the throes of packing up our stuff, and needed a bunch of boxes. I worked out how many boxes we would need, after Mrs Chillikebab told me she didn’t want to get involved, and I should just go and get whatever I thought we needed. I told her how many I was planning to get, and she looked incredulous and said ‘we’ll need more than that’. So I added half as many again to my list. But how to go and pick them up? Well, it was a lovely day, and the box place isn’t far, and I hate using the car – so it seemed the Radish was the go. I rode down to Kennards, and ordered what I needed. ‘Do you want a hand putting them in the car?’, the assistant asked. ‘Actually, I’m on a bicycle,’ I replied. I waited for the incredulous reaction, but she took it all in her stride. ‘Oh, right-o’, she said. ‘Is it a Schwinn? I’ve got a lovely Schwinn beach cruiser’. 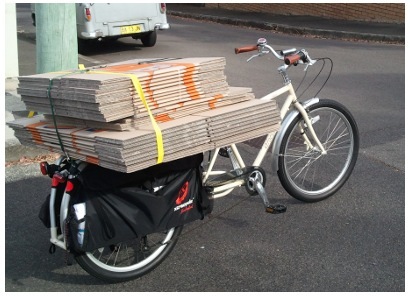 It’s marvellous when people don’t see bikes as unusual, and mention that they cycle themselves. Although I have to admit I was just a little bit disappointed with such a blasé reaction. 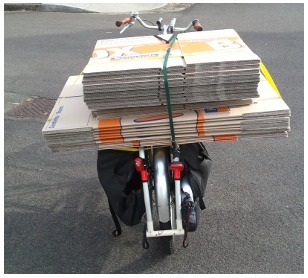 We took my twenty-odd flat pack boxes, my roll of bubble wrap, butchers paper, tape dispensers and so on out to the bike, and I loaded it up. All fairly easy, except I’d left one of the tie-down straps at home so it was a little bit touch and go if just one strap would be long enough. I just managed to feed a couple of centimetres into the clasp, however, and then was able to pull it tight. The ride home was uneventful, although it did seem car drivers were giving my rather precarious-looking load a wider berth than usual! Arnott’s Tic Toc is a highly educative biscuit that featured clock faces set to different times. This means you can use them to teach your kids to tell the time whilst simultaneously rotting their teeth, which I suppose then means they get to their dentist appointment at the right time. Clock faces aside, The biscuit itself is a fairly thin, plain affair made from flour, vegetable oil and sugar. 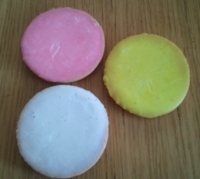 They are iced in three different colours – pink, yellow and white. The icing is applied in a fairly rough and ready way, and each colour tastes different. The yellow ones taste vaguely of banana flavour. (N ote that’s not the same thing as ‘tastes of banana’; they actually taste nothing like bananas, but rather taste like things that are labelled ‘banana flavour’. If you know what I mean). The pink ones have a hint of perfumed palma violets about them. The white ones seem to taste somewhat of banana flavour again, although I wonder if in fact they are plain but pick up the dominant banana flavour from the others in the pack. The icing is quite thick and crispy, and it’s clear that the biscuit is really just a medium to carry the icing. It’s even been suggested to me that you can eat away at the biscuit first, saving the icing until the end. Needless to say these biscuits are extremely sweet and artificial tasting and clearly not aimed at an adult palate. The excitement starts, of course, when you turn them over and realise that they have clocks on the back, all set to different times. Here is the full selection from the review pack laid out. There are fourteen different times on offer, with ‘ten past eleven’ being the most common, followed by ‘twenty past eight’ and ‘two o’clock’. I was wondering how these were made. My first thought was simply that there were a range of moulds with different times on them. However, I did start to wonder when more closely examining the ‘two o’clock’ version, as seen below. Now, is it the case that Arnott’s have a mould for both ‘two o’clock’ and ‘almost two o’clock’? I suppose it’s possible, but seems a trifle odd. However, I then had the thought that perhaps the moulds have hands that can be moved, stamping out different times at the whim of the operator. If this is the case, it is quite splendid and a hallmark of Arnott’s biscuit innovation. To sum up, them, there is a degree of entertainment to these biscuits which makes them interesting and innovative. However, ‘interesting and innovative’ does not necessarily mean ‘edible’, and as a biscuit these are actually not at all pleasant. Cloyingly sweet, artificial tasting and lacking structure. I’m afraid that these only merit a two out of ten. The Chocolate Wheaten is an oddity, as it does not follow the standard Arnott’s naming convention. 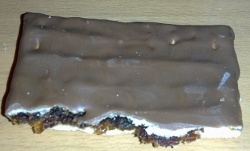 All of the other Arnott’s lines that consist of a regular biscuit that has been given a chocolate coating simply retain the original name – Chocolate Scotch Fingers, for example, are still simply called ‘Scotch Fingers’. Were this schema followed for the Chocolate Wheaten, it would simply have been called the ‘Granita’, as this is the plain biscuit on which this line is based. I think the reason for this is that the Chocolate Wheaten was inherited from Westons in 2003, and the name has been retained. I have not been able to ascertain whether the Granita was also marketed separately by Westons, and if not why Arnotts’ didn’t simply call the Granita ‘Wheaten’. The biscuit is a crumbly, whole-wheat biscuit that has a pleasant flavour that is excellent when dunked. The chocolate is the usual high-quality Arnott’s affair, although it is applied somewhat haphazardly to the biscuits, being very thick in some spots and very thin in others. And overall, they are very nice. The crumbly texture makes them very moreish and it’s very easy to plough through a whole packet. They come in both milk and dark varieties, but as is usually the case the dark is the one to go for. These merit a solid eight out of ten. 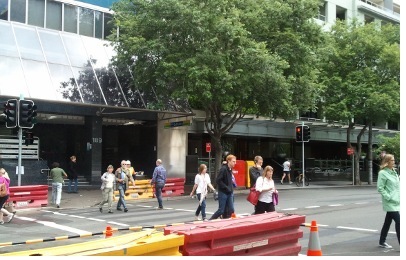 I can’t help feeling it’s a sad day for pedestrians in Sydney. The traffic lights at the intersection between Kent St and Bradfield Highway are now in operation. At least in part, this junction was signalised in order to facilitate the bicycle path that has runs along Kent Street, which I suppose is to be applauded. However, the result is now that pedestrians, rather than just crossing the road whenever they need to, are forced to wait several minutes until the little green man gives them permission. I think this is a retrograde step. 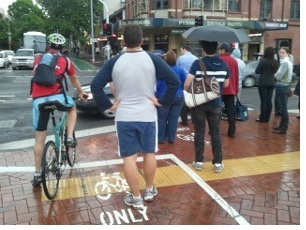 People should have priority over cars, not the other way around. I also see that the traffic seems to be queuing for longer too, so it’s for the most part not helping drivers either. I worry that this is a trend, and that zebra crossings are in general being replaced with signalised crossings. This is a pity, I think. I’d like to see lots more zebra crossings in the place of the current signalised ones. Make the cars stop for the people, and force drivers to pay attention to their surroundings. (And for those safety nannies out there, note that UK research shows that where zebra crossings are replaced by signalised crossings, the pedestrian injury rate tends to rise, not fall). Whilst on the topic of inadequate pedestrian crossings, the crossing at the western end of Pyrmont Bridge is also poor. It’s simply not wide enough to cope with the volume of pedestrian traffic – indeed, the footpath outside the pub is also too narrow. There really needs to be one less car lane here, and the footpath needs to be much wider. It causes problems for cyclists too, as there are frequently a lot of pedestrians waiting in the ‘cycle’ area, which for example means that bikes don’t trigger the bicycle lanterns because they can’t get on top of the sensors – as illustrated in the picture. In any case, the induction loop trigger on the cycleways are wholly inadequate. It’s a classic example of the RTA being unable to build anything except car infrastructure. Has anyone been able to get the lights at Kent / Erskine junction to trigger when going north? It doesn’t help that the sensor is for the most part in front of the stop line, but this morning I sat right on the middle of it on the Radish – a bike that has a lot of metal! – and the light didn’t trigger. Very frustrating. Still, riding the Radish always makes me happy. Actually, riding any of my bikes makes me happy, but in different ways. I’d like to spread that happiness around, so I’m going to do something a friend suggested and attach a bubble machine to the back of the radish. Then I can cruise around leaving a trail of happiness and bubbles behind me. One should always be slightly suspicious of biscuits that claim to be healthy. The whole point of a biscuit is that it is not healthy, but is a treat. The fruit slice range fro Arnott’s, however, are labelled ‘low GI’ and are part of the ‘Snack Right’ range (but kudos to Arnott’s for resisting the oh-so-modern temptation to label them ‘snak rite‘). The first thing you notice when you open them is that there are only four biscuits in a pack, with each biscuit coming in at a whopping 20cm long. I have to say I approve of this; it allows me to eat half a packet whilst legitimately claiming that ‘I only had two’. 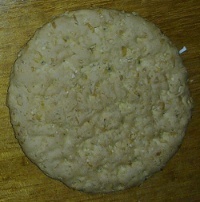 Each biscuit is divided into five sections, and it has been suggested that the idea is that one breaks them off one at a time – yielding twenty small biscuits. This is clearly nonsensical; the dividing lines are purely ornamental as evidenced by the fact that when you break them apart they often fail to separate cleanly along the joins. The biscuit is fairly soft, almost cake-like, and really only serves to bind together a large quantity of sultanas. They are then topped with a generous coating of milk chocolate. And they are very good. Very good indeed. Ignore the warning bells that go off when you see the health claims on the packet because these are yummy. The soft biscuit and abundance of fruit lends a seasonal air to the Sultana Choc, and then the chocolate topping adds an additional indulgence. It’s very very easy to eat a whole packet of these. And who can possibly say that eating four biscuits is over indulging? Especially when they are good for you. I’d give these a nine and a half out of ten. I’ve even been known to choose these over the awesome Mint Slice, especially when I’m hungry and fancy something a bit more substantial to eat. A top-notch effort from Arnott’s. One of the things I like about Arnott’s is that they don’t flog an idea to death. Having introduced a Raspberry Shortcake, many other lesser companies would have gone on to produce strawberry, apricot, chocolate and tropical mango shortcakes. Arnott’s, however, are content to stick to just classic raspberry. The biscuit appears to consists of two shortcake biscuits sandwiched together with jam. However, if that’s what you thought you would be mistaken. It’s not jam that sandwiches the two biscuits together. Oh no; it’s fun. Yes folks, that’s right; as the strapline on the pack proudly proclaims: ‘Raspberry Flavoured Fun in a Shortcake Biscuit‘. The top biscuit has a hole in it, allowing the fun to peep out somewhat in the manner of a Jammie Dodger. There;s something about this that just makes you want to press your index finger into the hole, and then examine your fingerprint. If you see a fingerprint in the fun before you start, then I’d say that was cause for concern. The shortcake itself is quite soft and crumbly, which immediately alerts you to the fact this is a wholly different beast tot he aforementioned Jammie Dodger. The fun lacks a really distinctive raspberry flavour, although this could be because it is overwhelmingly made from apple. Only 1.8% of the fun content is raspberry. So just how much fun are they? They are quite pleasant, but I’m not sure they are really dance-around-the-room fun. That said, the soft shortcake is quite moreish and it’s quite easy to chomp through half a pack without really realising it. I’d give these a six out of ten. There is a certain type of biscuit that is aimed at the health conscious market. And that market, I would contend, further splits into two. One group is interested in things with fruit that are very expensive because they only use carbon-offset fair trade organic raw palm sugar, and the other group is interested in something that will keep their bowels regular. This Shredded Wheatmeal seems to be aimed squarely at the latter type of consumer. The Shredded Wheatmeal, as the name suggests, is made with whole wheat that has been, erm, shredded. The biscuits contain a lot of this shredded material and, without wanting to be rude, they do look a bit like the things my mother-in-law gives her budgie to peck at. Although these are packaged up as a sweet biscuit in Arnott’s ‘No Artificial’ range (which, incidentally, has been recently renamed from ‘Wholesome Goodness’) they are not very sweet at all. They do need a lot of chewing, however, as the shreds take some masticating and can quite dry the mouth. Indeed, these biscuits are determinedly worthy, as befits the redemption offer whereby you can send in the bar codes from ten empty packs in exchange for a hair shirt. They are not all bad, though. They do have a pleasant enough home-cooked flavour, and the partner really rather well with a mature cheese and some quince jelly. Indeed, I can’t help thinking these were really designed as a biscuit for cheese, rather than as a sweet snack. Hard to give them a score. If you were given one with your cup of tea, well, you’d be disappointed. Only a three out of ten. But with a nice sharp cheddar and some celery – well, perhaps a seven or eight. But that’s not really what this is all about, so I think the three out of ten has to stand. Well, I finally found a willing victim passenger. I was attending a work function in the city last Thursday evening, and went straight from work. As I was getting ready to go, a colleague came over and asked if I wanted to share a cab. He looked at the radish. ‘Alright!’ he said. ‘Lets do it!’. back. Still, he said he was reasonably comfortable, so we set off into the peak-time traffic through North Sydney. As son as we got moving, I realised that this was a rather different proposition compared to riding with shopping, or a trombone. He was of course much heavier, the weight was much higher, and, most disconcertingly, he was moving about. ‘Just trying to get comfortable!’ he’d say, as he joggled about on the back as we sailed down Miller Street, swerving form side to side. It also made steering very difficult; as I leaned the bike into a corner he tended to shift his weight to stay upright. So I’d lean further left, he’d lean further right, and the bike would want to go straight on. This meant it was really necessary to haul the bike around corners by pulling the handlebars round – which was quite tiring. Not as tiring, however, as going uphill. The route from North Sydney to the City is mostly downhill (which is why I offered him a lift), but each time we hit even a slight incline I found myself reflecting on the fact that I perhaps should have chosen a more lightweight passenger for my first ‘plus one’ ride, rather than a six foot tall bloke who weighs about ninety kilos. Still, pride prevented me from admitting defeat, even though for some sections we ended up crawling along in granny gear no faster than we’d have managed if we’d both got off and walked. We did get up some impressive speed on the downhills, though – and my passenger had a real panic moment as we exited the SHB cycleway on the city side. I guess he couldn’t see what was coming up, and unexpectedly shooting into a narrow tunnel and then out onto a path that suddenly veers right is a bit disconcerting if you weren’t expecting it. I think that was the moment he started to re-think whether he’d made a wise transport choice. He was impressed with the cycle lanes through the city though – just perfect for this kind of cycling. The most amazing thing was the reaction we got from other road users. The sight of two forty year old blokes on a stretched beach cruiser riding through the city in smart clothes just seemed to cheer everyone up. I was worried that we’d get some abuse for holding up motorists with our antics, especially given how slow we were. But instead we got a lot of cries of encouragement, laughter and cheers as we went by. It helped that my passenger was full of it, and engaged passers-by with witty comments about how little work it all was, and what a great way it was to travel, and how fresh and cool he was, whilst I sweated away, head down, gasping for breath and grinding the pedals around. Apologies, but I don’t have any pictures of us. If anyone happened to see us at about 6pm on Thursday night in the city and took a photo, I’d love to get a copy!